Emma Metcalf Beckley Nakuina, Commissioner of Private Ways and Water Rights, wrote an article “Ancient Hawaiian Water Rights and Some Customs Pertaining to Them” published in 1893 in Thrum’s Hawaiian Annual. The following are portions of that article. 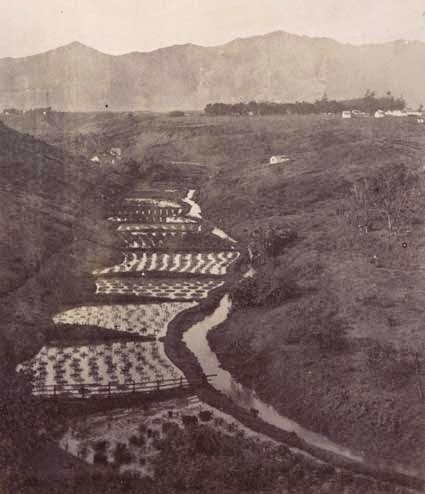 Water rights were primarily for lo‘i (pondfields,) that is, for kalo (taro) culture; potato patches, bananas or sugar cane had no recognized claim on a water right in the rotation. The cultivation of these, regarded as dry land crops, were invariably during the rainy season except in the Ko‘olau or wet districts. Sugar cane and bananas were almost always planted on lo‘i banks (kuauna) so as to ensure a sufficiency of moisture from the seepage or ooze between them. Each ‘auwai (water courses) had a proper name and was generally called after either the land, or chief of the land that had furnished the most men, or had mainly been instrumental in the inception, planning and carrying out the work. All ‘auwai tapping the main stream were done under the authority of the Konohiki of an ahupua‘a, ‘ili or ku. In some instances, the Konohiki of two or three independent lands united in the work of ‘auwai making. ‘Auwai were generally dug from makai (seaward or below) upwards. The different ahupua‘a, ‘ili or ku taking part in the work furnished men according to the number of cultivators on each land. The dams were always a low loose wall of stones with a few clods here and there, high enough to raise water sufficiently to flow into the ‘auwai. No ‘auwai was permitted to take more water than continued to flow in the stream below the dam. The konohiki of the land controlling the most water rights in a given ‘auwai was invariably its luna. He controlled and gave the proportion of water to each mo‘o‘āina (kuleana) or single holding of the common people cultivating on that land. … shut off all branch ‘auwai or runlets from the main ‘auwai, except those conducting water to lo‘i entitled to water at the same time, the luna wai – who should be with him during all this time – making the necessary division by means of a clod, stone or both; the water holder continuing to follow the water until it entered his lo‘i and the koele in his charge. Bordering on the upper portions of most ‘auwai were small lo‘i limited in size and number, generally on a hillside, or on the borders of a gulch. These lo‘i were generally awarded kulu or drops; that is, they were entitled to continual driblets of water, and no one having a water share may turn the water entirely away from them unless, in times of scarcity, it should be seen that these lo‘i were full to overflowing. It was a strictly enforced custom, that should any water right holder neglect to go, or furnish a substitute at the periodical ‘auwai cleanings, repairs of dam, etc., water would be withheld from the land of the absentee until such time as he should see fit to resume work for the benefit of what might be termed the shareholders of that ‘auwai . It sometimes occurred that a land originally entitled only to a small portion of water, but afterwards held or presided over by an industrious, energetic man; whose popularity attracted many to live under him, would be accorded an increased supply in consequence of his promptly furnishing as many or more hands than some land entitled to more water than his. After this had continued some time, the water-luna would recognized the justice of an increased supply for his land, and would either take a portion of water from any land failing in its due quota of hands, or as was more frequently done, simply adding a day, night, or both to the rotation; letting his land have the added time. Anyone in the olden times caught breaking a dam built in accordance with the Hawaiian’s idea of justice and equity, would be slain by the share holders of that dam, and his body put in the breach he had made, as a temporary stopgap, thus serving as a warning to others who might be inclined to act similarly. Taro patches near Lihue, Kauai-Mitchell-BishopMuseum-ca. 1886. In ancient times, native Hawaiians drew their water supplies from fresh water streams, springs, lakes and shallow wells. For centuries, Hawaiians recognized the life giving qualities and significance and value of water to their survival. Water is life; water is wealth. In pre-Captain Cook times, taro played a vital role in Hawaiian culture. It was not only the Hawaiians’ staple food but the cultivation of kalo was at the very core of Hawaiian culture and identity. The early Hawaiians probably planted kalo in marshes near the mouths of rivers. Over years of expansion of kalo lo‘i (flooded taro patches) up slopes and along rivers, kalo cultivation in Hawai‘i reached a unique level of engineering and sustainable sophistication. The irrigation systems enabled them to turn vast areas into farm lands, feeding a thriving population over the centuries before Westerners arrived. Dams that diverted water from the stream were a low loose wall of stones with a few clods here and there, high enough only to raise water sufficiently to flow into the ʻauwai, which entered it at almost level. With ‘contact’ (arrival of Captain Cook in 1778,) Western influence played into the management and use. Kingdom laws formalized and reduced Hawaiian customs and traditions to writing. Then groundwater was pursued when James Campbell envisioned supplying the arid area of ʻEwa with water. He commissioned California well-driller James Ashley to drill a well on his Honouliuli Ranch. In 1879, Ashley drilled Hawaiʻi’s first artesian well; Campbell’s vision had made it possible for Hawaiʻi’s people to grow sugar cane on the dry lands of the ʻEwa Plain. Subsequent well production expanded and diversified the collection and distribution of water. (Now, nearly all of Hawaiʻi’s drinking water comes from groundwater sources. Constitution amendments in the 1978 Constitutional Convention (later ratified by the people,) put water as a public resource. Under the State Constitution (Article XI,) the State has an obligation to protect, control and regulate the use of Hawaii’s water resources for the benefit of its people. Ground and surface water resources are held in public trust for the benefit of the citizens of the state. The people of Hawaiʻi are beneficiaries and have a right to have water protected for their use and/or benefit. Legal challenges and subsequent decisions by the Hawaiʻi Supreme Court identified four public trust purposes: Maintenance of water in their natural state; Domestic water use of the general public, particularly drinking water; Exercise of Native Hawaiian traditional and customary rights; and Reservations of water for Hawaiian Home Lands. In 1987, the State Water Code was adopted by the Hawaiʻi Legislature, which set in place various layers of protection for all waters in the Hawaiian Islands; it formed the Commission on Water Resource Management. 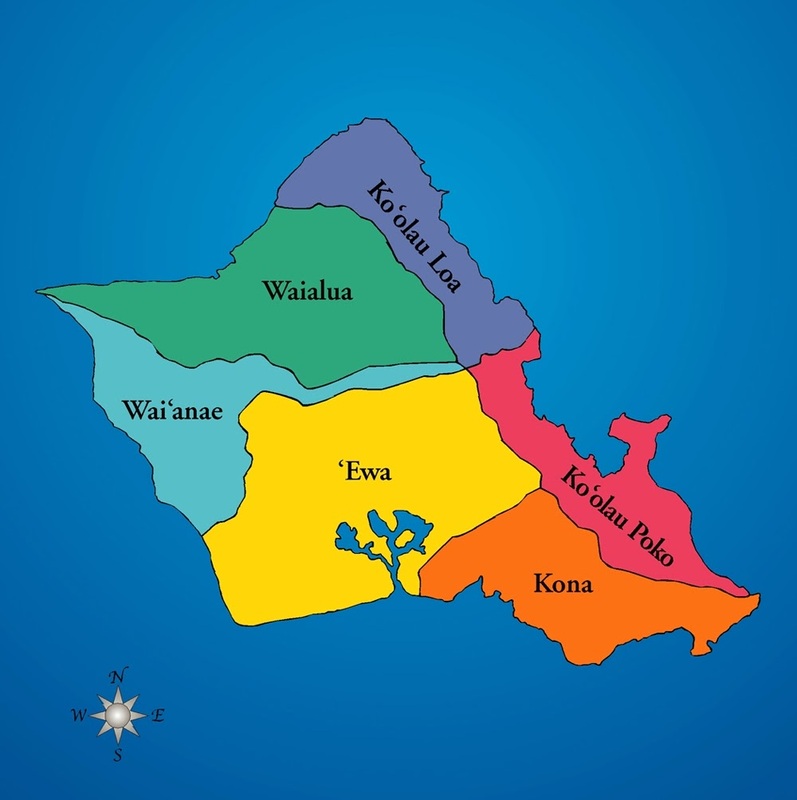 The Hawaiʻi Water Plan adopted by the Water Commission (that includes the Water Resource Protection Plan, Water Quality Plan, State Water Projects Plan, Agricultural Water Use and Development Plan and Water Use and Development Plans for each County) is critical for the effective and coordinated protection, conservation, development and management of the State’s water resources. We are reminded of the importance of respect and responsibility we each share for the environment and our natural and cultural resources – including our responsibility to protect and properly use and manage our water resources. I was honored to have served for 4½-years as the Chair of the State’s Commission on Water Resource Management overseeing, managing and regulating the State’s water resources. We are fortunate people living in a very special place. Let’s continue to work together to make Hawaiʻi a great place to live. The image shows Loʻi kalo near Līhuʻe, Kauaʻi (Mitchell, Bishop Museum, ca. 1886.) In addition, I have added other related images in a folder of like name in the Photos section on my Facebook and Google+ pages.